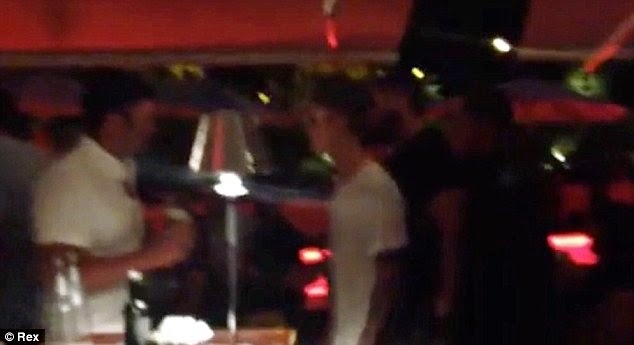 New footage, captures the moment actor Orlando Bloom throws a punch at Justin Bieber during a night out in Ibiza. The incident was recorded by onlookers as Bieber crossed paths with the Pirates of the Caribbean star shortly after entering popular eatery Cipriani with his entourage. Bloom, who wears a light coloured shirt, appears to make a beeline for the Canadian star before throwing a single punch. As members of their entourage engage in a scuffle to keep the two stars apart, Bloom is seen walking away before returning to gesticulate at Bieber, who sports one of his customary baseball caps. Shortly after the incident Bieber posted a picture of Bloom's estranged wife, Australian model Miranda Kerr, fuelling rumours he went on a date with her while they were still married in 2012. While representatives for Bloom and Bieber have refused to comment on the matter. 'Justin ducked, and Orlando's punch missed'. For years it has been reported that Kerr had been seen on a date with Bieber following a Victoria's Secret show in 2012. Clearly trying to irritate the situation further, Bieber then posted a picture of Miranda in a bikini with a symbol of a crown as a caption. After Orlando made his alleged punch, the singer - who was arrested for a DUI in Miami earlier this year - 'fled the restaurant,' according to the site. The British actor is almost 6ft tall and the Canadian performer is said to be 5ft 7in. It has been guessed that Bieber actually fibs about his height and is more along the lines of 5ft 4in. Cipriani was 'packed with celebs,' an insider said. Paris Hilton, Lindsay Lohan and Sean 'P Diddy' Combs were all reportedly in attendance at the time. Justin was seen with Orlando's now estranged wife Kerr at 2012 Victoria's Secret fashion show in NYC. It was reported that the two got 'very close' after the event, despite Kerr still being married to Bloom at the time. Kerr and Bloom announced their separation in October 2013 after three years of marriage, claiming they had split several months earlier. When Orlando was seen with Gomez in April, it was heavily speculated that they could have been on a date. Earlier in the day Bloom was seen with pretty women on a yacht in the Ibiza area. Erica Packer - the former spouse of Australian billionaire James Packer, who himself has been linked to Miranda, is thought to be one of them. On Tuesday, Bieber shared a photo where he was boarding a private jet with a pal. Both were shirtless and showing off tattoos. It is likely they were headed to Spain. Meanwhile, Kerr was seen in Munich, Germany at an Escada event on Tuesday. Also on Tuesday, TMZ reported that the Beverly Hills building in which Bieber has been living is hiring lawyers to deal with the star. He has allegedly been making so much noise with his parties that police were called six times in one weekend alone this month to his unit.